For a long time, owners of machines with non-commercial baskets such as some Krups and Sunbeam units have had to put up with pressurised filter baskets. These baskets have a pin-hole in the bottom through which the espresso is frothed up to make it appear as though genuine crema is being made. They can help to get acceptable-looking results from stale coffee but they limit the quality of result one can get with fresh coffee. 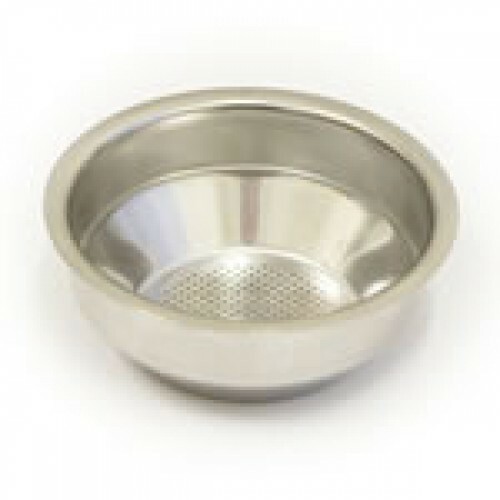 This Krups basket is an unpressurised basket with an internal diameter of approximately 51mm (exact diameter varies) and allows much better results when using fresh coffee. The picture above is of a style of basket used in many different machines, which often has numbers and level marks stamped into its side, making it impossible to supply a fitted tamper. Fortunately, Krups make an unpressurised (normal) filter basket which is almost identical in dimensions and has smooth vertical walls. The biggest difference is that the Krups unit is 2mm taller (22mm in total) so you should check there is enough depth in your portafilter to accommodate this. All this means anyone who wants the best out of a machine like this will get fresh whole beans, a grinder, and then one of these basket with a fitted tamper to match! Final caveat: While these baskets are known to be compatible with many machines accepting a 51mm filter basket (including the Breville Ikon, Breville 800 and the lower end Sunbeam machines), in most cases this will be an aftermarket part for your machine, and the nature of aftermarket parts is that there will be some differences to your original basket which may affect the way it fits or performs. While we are more than happy to discuss the suitability of this part for your machine or help out if the basket turns out to be incompatible with your machine, we can never know the fine details of every machine on the market so ultimately it is your responsibility to ensure the part is compatible with your machine when you receive it. Put simply, we are a retailer of the basket - we don't make any claim that it will necessarily work in your machine even though it works in nearly everyone else's.